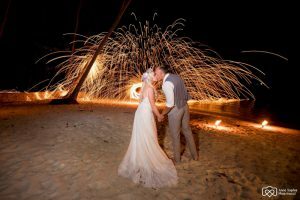 Nowadays, more and more couples are choosing to tie the knot abroad looking for the most affordable romantic getaways for themselves and friends and family. 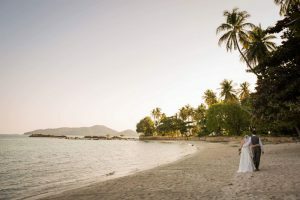 A beach wedding is one of the most popular choices and Koh Samui is right up there as a first class destination wedding option.With its beautiful beaches, stunning mountain landscapes, fine dining and luxury, affordable villas for rent, you can’t go wrong. Villa Kalyana, has been host to many weddings over the years and has proved itself as a perfect wedding venue. 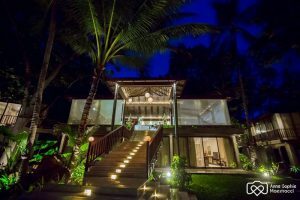 The Kalyana team have put together a sample itinerary based on guests’ requests and experiences to give you an idea of how a wedding works at Villa Kalyana. 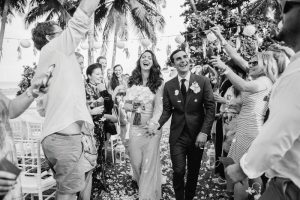 As the bride and groom, a lot of organisation and logistics rests on their shoulders to ensure everyone has accommodation, their individual needs are met and everything runs smoothly. Thankfully the Kalyana team share this responsibility and are there to help from first enquiry to check out. 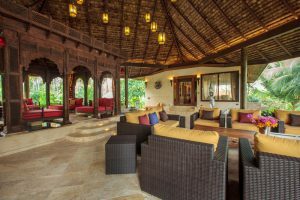 On arrival at the villa, everyone will be met with a smile and welcome drink and the in house wedding planner Rebecca is on hand to explain the workings of the villa alongside the villa staff. Rooms are allocated in advance and thanks to smartphones the staff have access to the room plans and everyone is taken off to their accommodation seamlessly. The itinerary of your stay can be printed with detailed information regarding timings so guests can check what is happening when and where, allowing the bride and groom to relax and go over everything with Rebecca for the ceremony day. Imagine, everyone waking up to the splendour of Kalyana, the lush garden, the inviting pool and the view out across the beach! 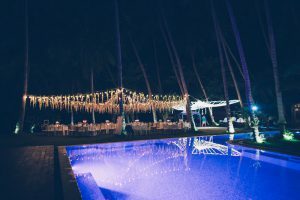 After a leisurely breakfast, the guests can while away a few hours with a massage, a yoga class, a dip in the pool or a stroll along the beach while the bride and groom get ready. Meanwhile, seamlessly and discreetly, the villa team prepare the venue. After a leisurely breakfast the bride gathers her friends around in the spacious master suite to begin preparations. The carefully, selected hair and makeup artist arrives at the bride’s door, followed shortly by a bottle of Prosecco and some nibbles to keep everyone going. Meanwhile the groom and friends get ready in their well appointed room to kick back and relax. By now the bride and groom will have realised that Rebecca with her calm and easygoing nature is their rock throughout the whole day. For an afternoon wedding, a delicious lunch for all the guests can be pre ordered. Everyone sits together with a variety of delicious sharing plates as they catch up and get excited about the upcoming ceremony. 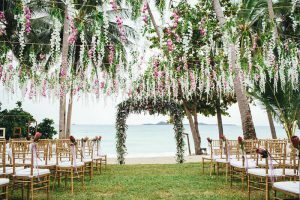 Guests congregate beachside to be met by pretty lanterns swinging in the breeze, exquisite flower arrangements and a beautiful ceremony arch. 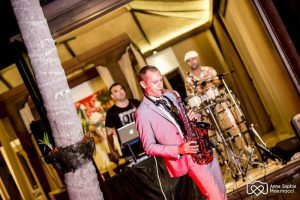 A solo saxophonist or acoustic guitarist entertains the guests as they arrive, mingle and enjoy the bride and groom’s chosen speciality welcome drink. This is just the start of where the guests can see the bride and groom’s decorative vision carefully adhered to and made reality in colour, design and execution. 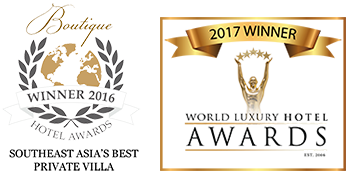 The click of the professional wedding photographer’s camera captures the event from beginning to end with both natural and posed compositions. The guests are welcomed to take their seats as the groom arrives to take his place. The celebrant starts by welcome everyone and giving thanks to everyone from the happy couple. 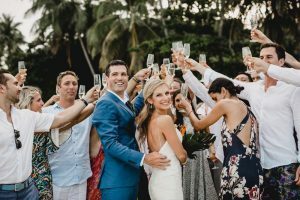 The celebrant remains calm and reflective having taken the time to get to know the bride and groom, their vows and type of service they dreamed of. As the bride and groom take centre stage, their favourite song plays either by the DJ or an acoustic musician. With the backdrop of the sea, the couple say I do, readings by family members take place or a blessing by a Buddhist monk can be arranged. Beautiful bouquets and cute flower girls fill the ceremony with colour. To create a stir and an even more memorable day, the groom could arrive by Hummer and the bride atop an elephant! No wedding day vision is too much to ask for! Following the ceremony, guests sign the guest book whilst the photographer and chosen master of ceremonies groups everyone for the official photos. The photographer will then take the bride and groom off for the first shots of husband and wife as they stroll along the beach or paddle in the shallows. 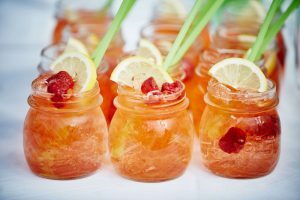 Cocktails and canapes are served on the lawn as guests marvel at how the lawn has been transformed into a beautifully decorated dining area ready for a magical dinner. 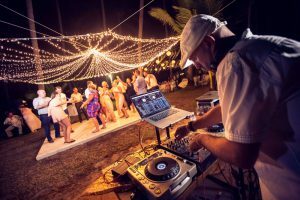 The DJ starts the chilled playlist to accompany the cocktails as guests mingle around the pool or on the beach. Once the MC has asked the guests to find their places – bespoke place names make sure everyone is where they should be, the speeches begin and so does the laughter and the tears! The bride and groom are toasted and it’s time for some of the most delicious food you’ll find in Thailand. 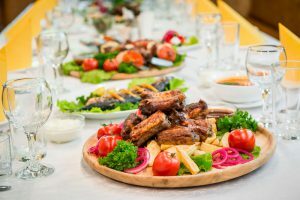 Dinner is usually a family style dining with a variety of Thai or western options from seafood to Thai curries and salads, whole fish, vegetarian options – the possibilities are endless but the wedding couple have selected it all to suit their guests. 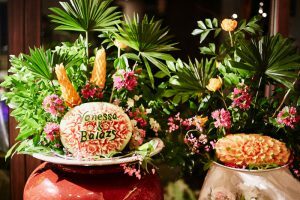 Take note of the fruit station with the cantaloupes and watermelons carved in unusual and amusing shapes with the wedding date and the names of the bride and groom! Guests choose from the delicious options for appetiser and main course – there’s always plenty to go around too! As the sun sets, the lights come on creating a fairy tale like atmosphere as candles flicker and fairy lights twinkle. As guests are finishing their dinner, the entertainment starts – fire dancers dazzle and amaze the dinners, or a live band play the couple’s favourite tunes, or a private firework display or a selection of party games for everyone to participate. The professional DJ then steps up to the decks and plays the first dance song for the newlyweds. Then it’s free for all, whether it’s eighties faves, nineties raves or seventies disco everyone gets up to dance away the end to a very special day. When the guest are ready for bed, or the children are sleepy, it’s not far to travel!. 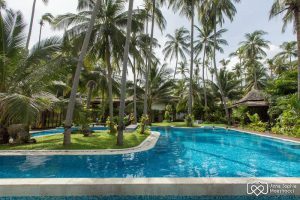 One of the best things about a destination wedding at Kalyana villa is that all or most of the guests are staying, so it’s a few steps from the wedding venue to their room, no transfer arrangements need to be made and they head to their beds when they need to. Should there be outside guests, travel arrangements via shuttle service can be organised for those who’d like to dance until the very last song. It’s always nice for everyone to get together again after the wedding and continue the special feeling in the group. 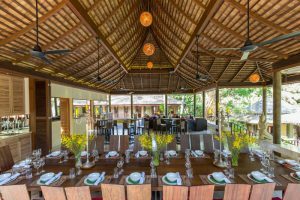 The private chef at Villa Kalyana can organise an amazing beach BBQ and– the villa team turn the beach into a dining room setting. The chef prepares the freshest of food next to the guests, as they sip from a fresh coconut water or something stronger. The salads, meat, prawns, fish and sausages are to die for. Another amazing about the villa team and Rebecca is they always have a backup plan that is known to the bride and groom and carried out calmly and efficiently if need be. Weather on a tropical island can be unpredictable, but should it shower, the team strive to keep the atmosphere going as guests are moved inside. The indoor dining room gets transformed as if by magic into and intimate and beautifully decorated setting for the dinner.